Which Car Should Buy Petrol or Diesel? Which Car Should Buy-Petrol or Diesel? Carbuyers are often troubled by the thought of which car to opt for – a petrol or diesel. We’ll help you make the choice. Diesel cars today have made great strides in terms of refinement and cubic capacity (cc). With constant fine-tuning and improvement, diesel cars have become better, more affordable and are proving to be an equal match for their petrol counterparts. This has a lot to do with the car manufacturer. When it comes to the overall refinement of diesel engines vis-à-vis petrol, the former lacks in terms of NVH (Noise Vibration and Harshness) levels. Then again, diesel cars higher up the segment are so refined that one can only hear marginal engine clatter on the outside, while noise inside the cabin is comparable to that of a petrol car. If you are really picky about NVH levels and can’t stand the clattering noise, a diesel car may not be a good idea. If you can live with a fair amount of noise or vibration, then a diesel car may not be a bad idea at all. Both diesel and petrol cars have their own share of power attached to them. Mass-market petrol cars have linear power delivery with great initial pick-up which means better response. The moment you press the accelerator pedal in lower gears, the car surges ahead but then it doesn’t really sustain the pulling power after certain RPMs. This results in better horsepower or PS but low torque (Nm). On the other hand, a mass market diesel car that generally comes fitted with a turbocharger can display a great amount of pulling power which is credited to its increased torque figures (compared to a similar petrol car) resulting in a thrust of power. However, all of this happens when you pass certain RPMs (revolutions per minute) on the tachometer. So, there is a considerable amount of initial lag (often called turbo lag) that you will face, which means despite pressing the accelerator flat, the car will take time to respond to your input. This will result in more torque and less power. If you’re a car junkie and demand a swift response from your car, a petrol car makes absolute sense. However, if you really love the thrust of sudden power, despite the initial lag, then a diesel car should be your pick. 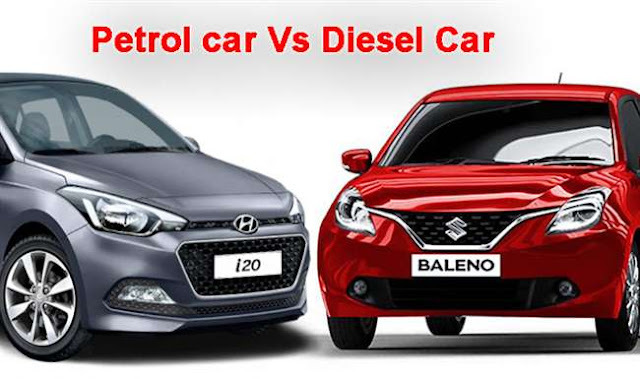 Let’s consider how diesel engines fare compared to petrol engines in terms of lifespan. Diesel engines are comparatively larger in size than petrol engines as they require higher air pressure for firing. A diesel engine starts to depreciate faster than a petrol engine if not serviced regularly. Excessive heat, friction and vibration are the primary reasons why a diesel engine disintegrates faster than a petrol engine. Diesel units use lift pumps which make the engine heavier. Petrol engines are lighter and use direct injections. Net weight of the engine with full fuel capacity plays a big role in deciding which engine will last longer. Petrol wins hands down with full fuel capacity. Petrol and diesel engines offer different mileage. Diesel engines consume more oil. Use of oil magnifies the frequency of maintenance. Diesel engines are used in multiple heavy-duty operations because of the powerful torque that they deliver for the same volume of petrol. Heavy-duty engines are used in tractor trailers, locomotives, ships and underground tubes. These are highly corrosive and high-intensity operations. Depreciation of a diesel engine is evident even with higher service intervals. Read Also We Should Buy Home Insurance Or Not? While diesel has some obvious advantages like low fuel cost and better mileage, its service and maintenance, however, will cost you more than petrol. Then again, these days diesel engines have become much smoother and quieter. They are also free from lead and regulated oxide pollutants. If you live in a cold country, a diesel engine will definitely exceed its lifespan, almost twice the margin of a petrol engine. This is because cold start engine in diesel cars is quicker as compared to petrol lighters. Remember to not just buy a car considering its great mileage and cheaper fuel price; consider costs like the car’s overall running cost and the tenure that you would want to keep it for. If you’re considering keeping a car for long and drive more than 80-100 km a day, diesel can be a valid option. If your running is less and you don’t prefer keeping a car for more than 3-4 years, go for petrol. Related Posts of "Which Car Should Buy Petrol or Diesel?"